The Yellow River lights wish you all a happy New Year! Time hastily never stopped because of our nostalgia. With an infinite love, we wave goodbye to the wonderful 2017! With a beautiful look forward to us, we are welcoming a brand new 2018! In the past year, the brothers and sisters of the Yellow River have united and achieved remarkable results for the company. Whether it is the development of new products or the promotion of old products, every drop and every point of achievement condenses the sweat of every one of us. 2017 is the year of the Yellow River! 2017 is a happy year for the Yellow River! 2017 is the year of the Yellow River harvest! We sincerely thank all the customers who have always supported and recognized our products! Thanks to all the friends who are inclusive! I am also grateful to everyone who worked tirelessly for the Yellow River! We believe that in the new year, the Yellow River lights will surely illuminate every step of our journey! 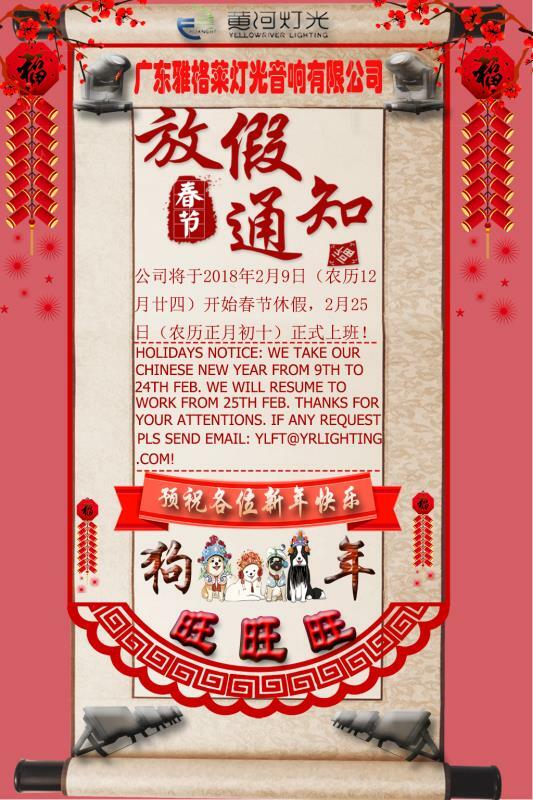 In the new year, the Yellow River Lighting will do its utmost to serve every lighting enthusiast, engineering company, and new and old customers who have always supported us! Here, all employees of the Yellow River wish you all a happy new year! Everything goes well! The year of the dog is good! Wang Shangjiawang! ! 上一页：The first lighting console training class starts!